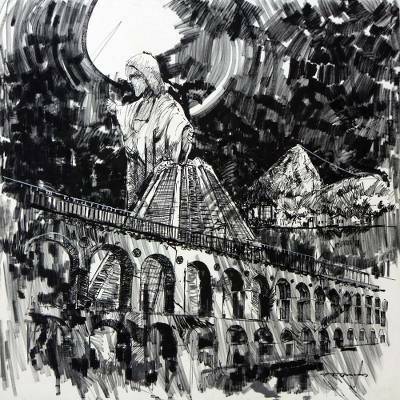 Original Black & White Painting of Rio de Janeiro Icons, "Rio in Black and White"
Rio's colossal art deco sculpture of Christ the Redeemer dominates this painting by Roberto Goncalves. The Cathedral, the Arches of Lapa and Sugarloaf Mountain are dazzling in the moonlight. Working in black and white, Roberto Goncalves depicts icons of Rio de Janeiro. Titled "Rio de Janeiro em preto e branco" in Portuguese. You can find 'rio in Black and White' (2015) by Roberto Goncalves in paintings categories such as Cityscape Paintings, Expressionist Paintings and Acrylic Paint Paintings. Enjoy exploring these sections for other Novica treasures. Roberto Gonçalves is a highly talented painter, recognized among his peers for the unique work that he produces. An admirer of abstract expressionism, Gonçalves paints compositions whose complexity and beauty unite the qualities of abstraction and expression in an inventive and interesting style. Gonçalves's career as a fine artist is marked by various exhibits in Brazil and abroad, such as the First Exposition of Art in Amsterdam, Holland. He has received a variety of awards for his work, among them the Cristopher Columbus Award for Painting and Second Place from MASP (Museum of Art of São Paulo) in the young artists category. His works are featured in collections in Mexico, Portugal, New York, and Brazil. We just received the ""Conductor"" and the ""Tube"" and are absolutely thrilled. My husband loves this type of work and said it is more impressive, rich, and beautiful than on the website. He is very satisified. I don't usually like abstracts but these are quite lovely and will look wonderful when framed and one sits over the fireplace and the other over the sofa of the family room. How about one in green in a vertical direction so we can complete our room? Wonderful work! Thank you.